Without ball, player moves between these two positions (1) and (2), depending of who is controlling the ball - the own or the opposite team. (1) - "Team in Defend" hold position. When the opposite team controls the ball, the player moves to that point on field and will stay close to it. (2) - "Team in Attack" hold position. When teammate controls the ball, player moves to that position and stay nearby. He can leave his route (or position) if he should stop opposition player or to get the ball. Player could move back if there is an order to keep the ball and there is a stronger enemy(es) in front of him. These choices are based on probabilities. 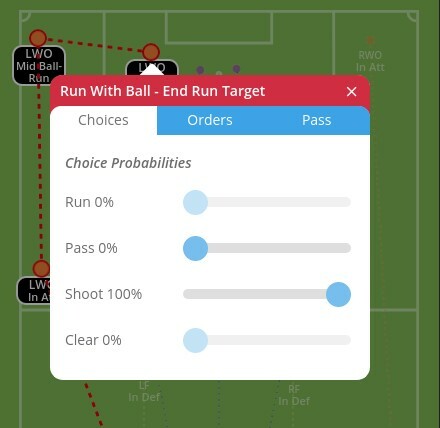 The managers can set these probabilities in Tactics editor for all hold and target points of the path. When player is exactly on such a point he will choose exactly by the ordered probabilities. 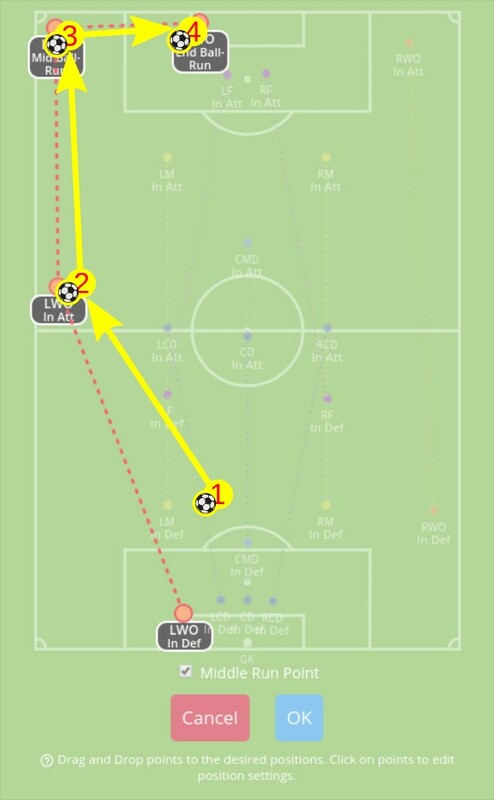 Most of the time, the player will not be exactly on target points, but somewhere between two of them. The example below explains the probabilities on such a position (between two points). (For a simplicity - the position is exactly at the middle between the points, and only two probabilities are set (run and pass)). The probabilities for that choice are just the average between these that are ordered on the both positions. ((The same scheme is applied on "Orders" and "Pass Weights" too - the other tabs)). Will the player follow these instructions or not, depends from his Decisions skill. - It should be chosen only one - Pass or Shoot, which should be set at 100%. For every hold or target position, the managers can set different orders or the just the same, according their needs. - "Keep the ball from stronger enemies" - if there is a strong enemy(es) in front of the player, he will move in opposite direction, trying to keep the ball and his passing desire will grow. 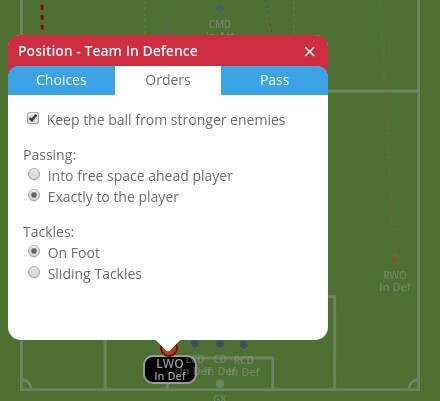 Following these orders depends from player's Decisions skill as usual. 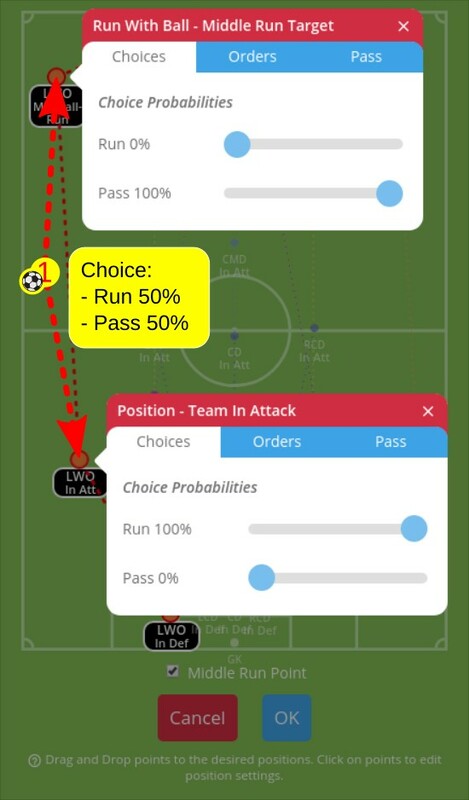 Decisions skill is very important for individual tactic orders. From this skill depends following or not the orders. Before every choice, order, etc. the engine measures player's decision by taking a random number from 0 to 150. If this number is lower than player's Decision skill, the player will follow the order, if not - the player will take choice by his default behavior.